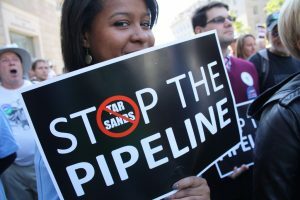 The Nebraska Public Service Commission has approved an alternative route for TransCanada Corporation’s controversial Keystone XL pipeline. The commission’s 3-2 vote Monday resolved a large regulatory problem facing the $8 billion project. This alternative route, farther east of the current path, may force TransCanada to create property agreements with landowners in six new counties. The Trump administration backs the decision, overturning Obama’s previous plans to stop the construction of the environmentally unsafe pipeline. Republicans and supporters believe that the pipeline will reduce oil prices and create more jobs. Despite the support, the project’s completion is currently undetermined due to opponents and financial uncertainty. A week before the approval, TransCanada noted an oil spill in South Dakota. As a result, Nebraska landowners became uncertain of the XL pipeline’s environmental impact. The decision has resulted in massive opposition by environmental groups, such as The Sierra Club. The Club continues to push forward with its fight against the pipeline. In effect, the Sierra Club hopes to delay the project’s completion and maintain community health and water quality.